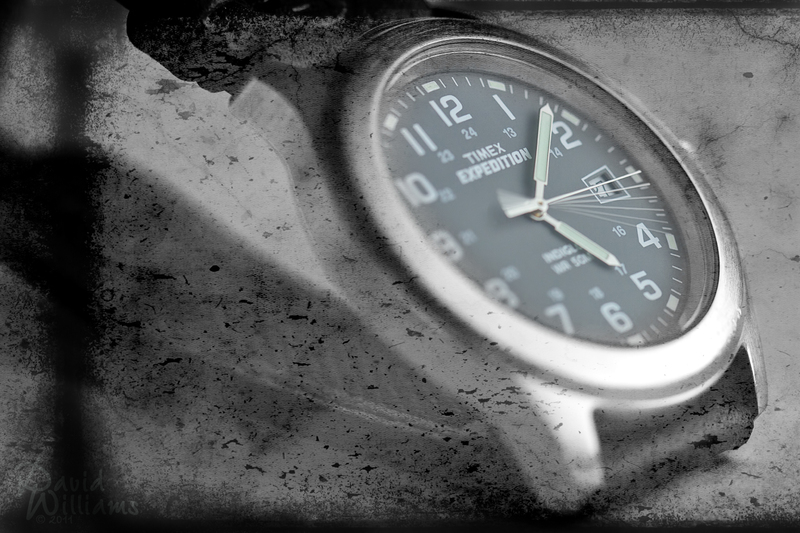 Okay, so the thought was capturing time flowing backwards…interesting no? Composite shot, only six images this time. A texture layer, B&W layer, masks on all of them (a masquerade cs5 ball..okay, that was lame). As I was finishing up, I thought it would be kinda cool to really call out the face of my trusty, no frills watch (it’s super hard these days to find a watch that only tells the date/time) so I decided to bleed the colour through. Your thoughts? Thank you very much! I had fun with this one. I really like these conceptual images from you – nice work! I really like this shot — almost as much as the watch photo from a couple weeks ago! I think there’s just enough color bleed through to make the shot more interesting without the color becoming distracting. Really good job! Like the shot David, creative! So what were the other layers David? Texture layer, B&W layer, … Are the rest of the layers separate exposures of the second hand to get the sweep? BTW, I do like the colour bleeding through on the watch face. Where to begin? Let’s start off by that I name all my layers so I remember what on earth I did if I ever have to go back! 😛 First thing I did was move all the images in (6 layers total). Masked them all and brought in only the parts I wanted and lowered the opacity on 5 of the second hands. After I was happy, I saved the file, flattened the 6 layers and re-saved with a different version number. Okay, 1) WB layer (tweaked the WB a tad, no mask used). 2) CA layer (mask used). There was a little CA along the side of the watch which I removed (mute point eh since I converted that portion to B&W). 3) Heal (self explanatory, no mask used). 4) B&W (mask used). 5) Texture (mask used). Whew…dizzy yet? I like the watch. Not sure I like the texture on this one. Looks like you sneezed on the photo. But overall it makes a good image and a creative interpretation of the assignment. Ha! That comment made me laugh Mike. Made me laugh too Mike(s)! I really like what you have done here David. I don’t have any technology feedback, but when I first saw it, it made me think about what I was looking at because I was drawn to it. Nice work. Thank you very much Martina, what a great compliment!